A Military Medal Group to Private Keane - Military Medal (32880 PTE, P. KEANE. 1-R.S. FUS. ); Queen's South Africa Medal, CAPE COLONY, ORANGE FREE STATE, TRANSVAAL, SOUTH AFRICA 1902 (7287 PTE. P. KEANE. R. DUB. FUS. ); 1914 Star, 1 Clasp - 5th AUG. - 22nd NOV. 1914 (3-3092 PTE. P. KEANE. R. HIGHRS. ); British War Medal (3-3092 PTE, P. KEANE. R. HIGHRS. ); and Victory Medal (unnamed). Naming is officially impressed on the first four medals. Court-mounted, with swing bar pinback, ready for wearing, light contact, near extremely fine. 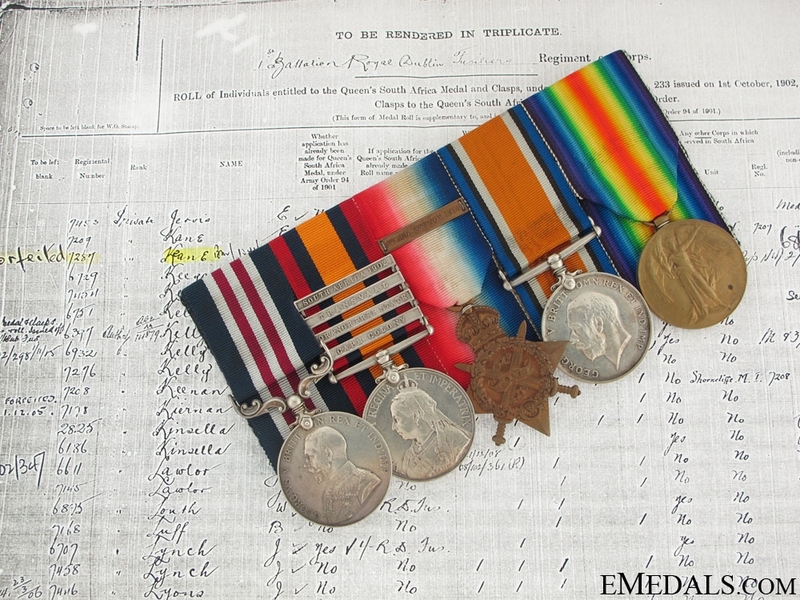 Accompanied by copies of the QSA Roll of Individuals (marked "Forfeited" in first column and "Red'd 2.5/07"), the London Gazette (January 28, 1918, p. 1390, citing his Military Medal).